Founded in the Queensland outback in 1920, Qantas Airways is the world’s longest continuously operating airline. Today it is widely regarded as the world’s leading long-distanceairline and one of the strongest brands in Australia, responsible for an estimated $1.7 billion in revenue for the fiscal year 2009/2010. The airline is committed to continually improving the experience on its website, qantas.com, whether enabling travelers to book all partsof a holiday or to self-manage their travel experiences. Since the site was first launched in 1996, it has evolved into the airline’s primary customer contact channel. 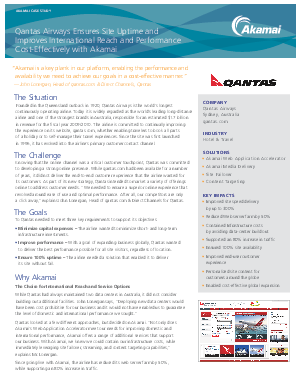 The ChallengeKnowing that the online channel was a critical customer touchpoint, Qantas was committed to developing a strong online presence. While qantas.com had been available for a numberof years, it did not deliver the end-to-end customer experience that the airline wanted forits customers. As part of its new strategy, Qantas intended to market a variety of offerings online to address customer needs. “We needed to ensure a superior online experience thatrevolved around ease of use and optimal performance. After all, our competitors are onlya click away,” explains John Lonergan, Head of qantas.com & Direct Channels for Qantas.